Hearing Adnan al-Sayegh reciting in Arabic, the mere rhythms and sounds send a shiver down the spine. Thanks to translations by Stephen Watts and Marga Burgui-Artajo, English readers have been granted a tantalising glimpse into the work of this politically-outspoken lyricist. Over the past years al-Sayegh has performed to audiences around the Arab world, Latin America, Sweden, The Netherlands and at London’s National Portrait Gallery. He took part in A World to Win’s “Walls Came Tumbling Down” symposium in front of the Guernica tapestry at the Whitechapel Art Gallery in 2009, and our event about people’s assemblies at Passing Clouds recently. I am the guitar, but who will play me? I am the tears, who will mourn me? I am the words, who will echo me? Besieging me from every direction. A voracious reader since his youth, he is a near contemporary of Arab poets, such as the late lamented Mahmoud Darwish, Hasab al-Shaykh Ja’far and Adonis. But al-Sayegh is equally inspired by ancient and modern Greek culture, Turkish poets such as Nasin Hikmet, and northern Europeans - Hölderlin, Rimbaud, T.S. Eliot and Eluard. His world is our own world, grasped in stark moments of horror combined with a craving for freedom and fulfilment. The earthy, tormented lines have a metaphysical component, in the awareness of death, decay and loss coupled with the acuteness of sensuous pleasure – “this mouth must devour something”. He has introduced new words from the street into classical Arabic and broken up lines, often to the shock of formalists. He dismembers language and re-configures it, forging brilliant images such as the “clothesline of war” and “the pavement of my poems”. Or in the places of exile – as homeland by instalment. “While I lived in Sweden,” al-Sayegh recollects, “journalists asked me what I felt about the fall of Saddam – I said: ‘Look, the trees are dancing, the buildings are dancing, the sky has changed colour! We can be happy, because people love freedom’. Iannis Ritsos, the Greek poet who spent years in prison, said ‘freedom is first, is first’, and I agree. The Gods give us some years to live, to dance, to love.... to enjoy life. Why should we spend this time fighting? Why? In 13 years of war in Iraq I lost so many, many friends. One of his latest books, published in Beirut 2011, includes poems written during the war between Iraq and Iran. He is still agonises about the futility of that conflict. “I hated war. Young Iraqis were forced to fight with Iran, then with Kuwait, then with America - 13 years of war. I weep thinking of how many young friends died in that war. Why? Why? They were such kind people. But if they refused to to join up, the government would kill them. When I look at their photographs, I cry. “My country is beautiful, rich, with wonderful ancient cultures – Akkad, Babylonian, Sumerian, Assyrian and beautiful rivers - the Tigris and Euphrates - and we then had a dictatorship which cast everything aside. As a child, I dreamt about the beauty of my country and began to write poetry as a ten-year-old and have continued to do so all my life – it is my heart, my soul. Poetry was my friend after I lost my father and my friends. Then the dictatorship came and so many bad things occurred. I loved peace but there was only the sound of guns. The government did not give the people freedom and it fought the Kurds in Northern Iraq. “During the war against Iran I published six books. When I was in the military, the authorities forbade us from reading books. ‘You are supposed to fight, not read’, they said and so I was sent to prison simply for reading. “We were incarcerated in a stable in north Iraq in a small town called Shiekhwasal, in Sulaymaniyah. I spent two years there. Bombs were raining down, but we had no chance of escaping. A manuscript I had submitted years before was published in Baghdad in 1984. People were amazed and the book was being celebrated even while I was in prison! “I wrote line after line after line by candlelight even though I was weeping. But I kept on and I hid the manuscripts. Two years later, and after my release from prison, when the war with Iran was over, I escaped first to Damascus, and from there to Beirut. Then I completed my long poem Uruk’s Anthem, which was published in Beirut in 1996. I wrote it at a time I believed I would die. I was on the verge of being arrested and killed. 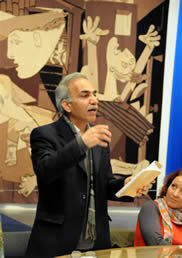 Al-Sayegh believes that poets have an important role in the Arab awakening and political change as a whole. "People have always loved poetry. In ancient times, poets were like travelling journalists and recited and people loved it. Things have changed, but when people listen to poetry it can make them feel and propel them into taking action and understand they can change their own lives. “Here, as the Occupations at St Paul’s Cathedral and elsewhere reveal, people are concerned about the economic issues, but in my country, there is no problem with money. It is a rich country. The most important thing is freedom. The issues of wealth and poverty are in the background but the most important thing is simply to be alive, to go out, breathe the air and see the earth, to shout and move. Before now, we were too terrified even to talk at home in case a child picked up something and repeated it and it came to the attention of the police. It is not as bad now, but you still can’t speak about religion or government. * Uruk is the original name for Iraqi culture in the Sumerian era. With 500 pages, Uruk’s Anthem is one of the longest poems ever written in Arabic literature and took 12 years to complete. One excerpt is translated and included in an anthology of Iraqi poets and another as part of a novel by an Iraqi writer. A translation into English by Stephen Watts and Marga Burgui-Artajo is in progress.